Amino acids, linked together in a long chain and then folded into a globule or fiber, make up a protein molecule. You require protein in your diet because the amino acids in the protein are necessary for your body to create the muscle tissue, hormones and enzymes that you need for good health. Your body must digest your food proteins to access their amino acids, and you do this with the help of protein digestive enzymes. The basic function of protein digestive enzymes is to break the chemical bonds that link a protein’s amino acids together. Because of the globular or fibrous nature of an intact protein, digestive enzymes cannot reach the chemical bonds between all of the amino acids until the protein is unfolded. Your digestive system accomplishes the unfolding with the highly acidic gastric juices in your stomach. Once the protein structure relaxes, digestive enzymes in your stomach and small intestine attack specific sites on the amino acid chain, breaking the protein into smaller pieces called peptides. A variety of digestive enzymes that are specific for proteins are produced within your gastrointestinal tract. Pepsin is the first protein digestive enzyme that a food protein encounters. Pepsin resides in your stomach and differs from other digestive enzymes in that it is active only in very acidic environments. Once pepsin cleaves your food protein into peptides, the peptides move to the small intestine, where they encounter digestive enzymes secreted from your pancreas and epithelial cells of your small intestine. These enzymes, including trypsin, chymotrypsin, elastase, carboxypeptidase and aminopeptidase, function to break the peptides down into smaller peptides and finally individual amino acids for absorption. Pepsin originates in cells that line your stomach. Pepsin is stored in an inactive form called pepsinogen, which is activated to pepsin in the presence of the gastric acid that is released when food enters your stomach. The digestive enzymes secreted from your pancreas into your small intestine, and those secreted directly from your small intestine, are also produced in inactive storage forms to protect your cells from random protein digestion. Other enzymes activate protein digestive enzymes when they receive a chemical signal indicating the need for protein digestion. 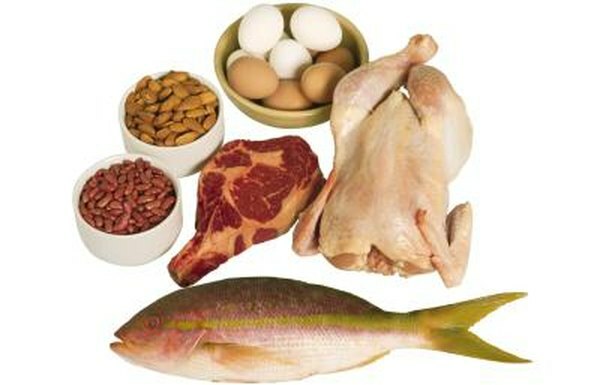 Enzymes that digest proteins often function by cleaving the bonds next to or among specific amino acids. For example, trypsin breaks the bond on one side of the amino acids arginine or lysine, while chymotrypsin cleaves the bond next to the amino acids leucine, methionine, phenylalanine, tryptophan or tyrosine. In contrast, the protein digestive enzyme aminopeptidase clips the bond of whatever amino acid is on the amino, or nitrogen-containing, side of the peptide. In this way, it snips off one amino acid at a time until the peptide is completely digested into individual amino acids.